During World War II, every school child in America knew all about the infamous “Bataan Death March” which was a 100 mile forced march of American POWs in the Phillipines. But the 100 mile march out of Buchenwald, we didn’t know. Besides the Bataan Death March, the only other mention of a 100 mile march, that I could find by searching the Internet, was the death march on November 8, 1944, when the Nazis forced 25,000 Jews to walk over 100 miles in rain and snow from Budapest to the Austrian border, followed by a second forced march of 50,000 persons, ending at the Mauthausen concentration camp. But as the Allied advance continued he [Jack Aizenberg] was put on a two-week death march to Theresienstadt concentration camp in Czechoslovakia. “It took two weeks,” he says. “There were 600 of us when we started, but only 60 survived. Towards the end of World War II, there were Red Cross representatives present in all the Nazi concentration camps in Germany, as preparations were made to turn the camps over to the Allies. The Theresienstadt camp was turned over to the Red Cross in the last week of the war, when the SS guards left the camp. There were three trains on which prisoners at Bergen-Belsen were sent towards Theresienstadt, but only one of the trains made it because the Allies were bombing the railroad tracks. I previously blogged about the trains to Theresienstadt here and here. It makes sense that Jews in the Buchenwald camp would have been sent on foot to Theresienstadt because trains could not get through. So why is this 100 mile death march to Theresienstadt so little known? As far as I know, Jack Aizenberg is the only Holocaust survivor who has talked about it. Another thing that Jack Aizenberg mentioned in his story is the soap made from Jews at Buchenwald. Yes, the Nazis made soap out of the Jews at Buchenwald. Don’t try to deny it, especially if you live in Germany, because you could end up in prison for five years. The Russian advance into Poland did not lead to freedom. Jack and his fellow prisoners were loaded on to railway cattle trucks and taken to the notorious Buchenwald concentration camp. “One day they gave us all a little piece of soap with initials on it like you get in hotels. It stood for ‘pure Jewish fat’. At the International Military Tribunal at Nuremberg in 1945, the Soviet Union charged that the Nazis had made soap from human fat. 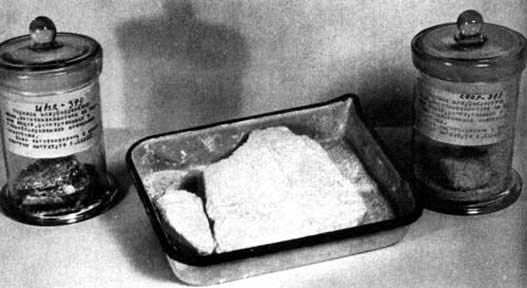 The photo below shows the soap that was displayed in the court room. 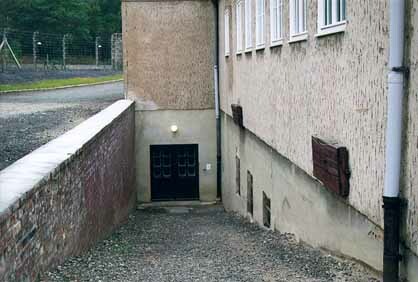 When I visited the Buchenwald Memorial Site in 1999, I was told that the Nazis had made soap in the basement of the building shown in the photo below. The Red Cross took over the running of the camp and pressure was put on the British Government to provide homes for some of the orphaned children. Permission was finally given for 1,000 children under 16 to enter the country. And Jack was among the first 300 orphans, flown to Windermere in Cumbria as it was thought they would recuperate faster in the country. “I had to lie about my age to get on the plane. I was 19 but we had no papers. “I was the last to get on the plane because I was ticking off the list. When I got on the fear and the hunger was gone. The Commandant Hermann Pister received orders from Berlin to get rid of the prison population before the allies could discover the camp. But Pister hesitated. Historian Robert Abzug attributes this hesitation to Pister’s practicality. Pister knew that Americans were coming and he wanted to present himself well, so he slowed attempt to evacuate and kill the prisoners. Between April 3rd and 10th over 20,000 inmates were transported out of the camp to Dachau, Flossenburg, and Theresienstadt. Most died on the journey. Through the communist resistance groups within the prisoners’ ranks, many SS orders were outright defied or stalled. Chaos began to reign within the camp. Pister did not threaten the inmates with the usual force and by April 10th he fled with most of the SS guard leaving only a skeleton crew to control the camp. So what is going on here? Note that the prisoners were “transported,” not marched out of Buchenwald. Why is there no website that supports Jack Aizenberg’s story of the 100 mile march? The British are making a big effort to teach young people today about the Holocaust. But are they going too far? I am getting the impression that the British are trying to bring down the whole Holocaust story, by telling outrageous lies — and they are succeeding, in my humble opinion. See Alfred Hitchcock’s “lost” Holocaust documentary: the death march from Buchenwald to Terezin is mentioned. My father was there. One of the 60( of 600 ) who survived. He confirmed, independently Jack Aizenberg’s description of events. AFAIK, there was no “death march” from Buchenwald to Theresienstadt. There was a march. My grandfather’s brother( a czech imprisoned for political reasons) survived it and told my father all about it ehen he was a kid in the fifties and early sixties. I always wondered why I never heard about it in relation to Buchenwald until right now. Another day, another Ho£ocaust story in the mainstream media, there’s simply no let-up in the bombardment, it’s inescapable. I’d wager that the majority of Mirror readers didn’t even bother reading as far as the “soap” claim, but that doesn’t matter, the purpose of the article was achieved, i.e. remind the proles about the evil Germans and the poor, poor, innocent, helpless Jews. I’ve finished uploading and labelling my photos for Sachsenhausen now FG. There’s some real good ones. If you fancy a look. I see from your photo of the museum sign: The route the gassed corpses were taken to the crematorium, missed out the mortuary where the gold teeth were removed. Maybe that’s why the new sign put there in 2004 doesn’t mention anything about the route. It was the mass-grave of the 7,000 Germans, killed in the NKVD camp there, including a boy of 18 or 19, who’d been just 14 or 15 at the end of the war, that I found really upsetting. Why would there be such a website proclaiming the horrific stories of jack aizenburg and the death marches. I have met him, he is such an incredible human being and he may tell people his story, but that is by word of mouth. Not by lazy bloggers/website creators who think they have the right to produce websites telling other people’s stories. There are holocaust survivors who believe it is write to speak about these stories, but they do not post them all over the internet. I don’t believe that there was any such 100 mile march. If there was such a march, someone else would have mentioned it. According to Jack Aisenburg, there were only 60 prisoners, out of the 600 on the march, who survived. A march, on which 540 Jews died, would surely have been mentioned by someone. I have been to both Buchenwald and Theresienstadt, and visited the museums there, but there is nothing about the march in the museums. There is no memorial or monument to the marchers in the Memorial sites for these camps. not sure if you will receive this but if you do.. i believe in the death march because my grandfather Harry Fransman holocaust survivor has spoken about it the death march.. and when i read your story from Jack Aisenburg many similarities were found. i also googled the distance from distance leipzig to Buchenwald or reverse and its not far off 100 miles. Just because its not talked about.. definitely doesnt mean it didn’t occur. i hope to get a reply. There was a death march, I know this because my father was in it. Thanks for writing this. It is so important that everyone know about what happened at the beginning to the end.